Playscape Recordings is proud to release Zephyr(PSR #040115), the latest release from veteran guitarist/composer Michael Musillami with his flagship trio, featuring bassist Joe Fonda and drummer George Schuller. 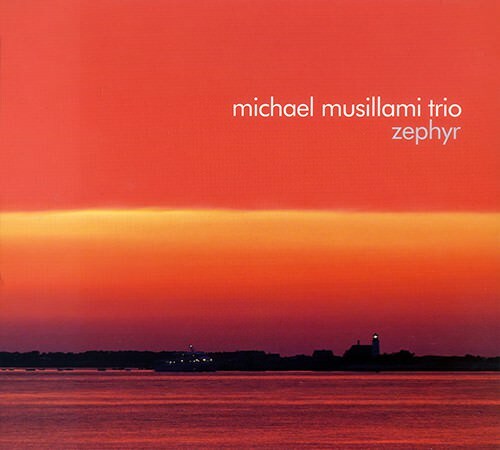 Zephyr is the Michael Musillami Trio's eighth release in the group's 13-year history. Although the finished product culminated in the studio, Zephyr's evolution began as the trio kicked-off a tour in March 2015 with brand new music beginning in Edmonton, Canada and ending in Lafayette, Indiana. From the first track, Loops, a tribute to the late bassist and long time friend Dave Shapiro, Musillami's music continues on a nostalgic path with memories of his childhood in Pacific School, and of family vacations in Lake Tahoe with Zephyr Cove, to the last track Remembering Dawn in memory of his daughter-in-law's mother, Sandy Hook principal Dawn Hochsprung. Traveling back from the tour and exhilarant from the enthusiastic response from listeners at every venue, the trio unanimously agreed this new music was ripe for further documentation. "We had rehearsals prior to the tour, but knowing where new music will take us is only ever realized on the bandstand," writes Musillami in his liner notes. "It was such an explosive tour that during the 14-hour drive back to NYC we were all in agreement that we should document this new set as soon as we could get into the studio." The trio's sense of urgency paid off and from the road Musillami booked a session just two weeks away at Firehouse 12 in New Haven, CT.
Musillami's career spans more than 30 years and includes extensive work as a performer, bandleader/composer and educator. In addition to his trio, which has performed across Europe and North America and released seven other recordings since 2002, he has earned international acclaim as the leader of groups ranging from duo to octet. When not working with his own bands, he teaches at The Hotchkiss School in Lakeville, Connecticut, and manages Playscape Recordings, the highly regarded independent label he founded in 1999.